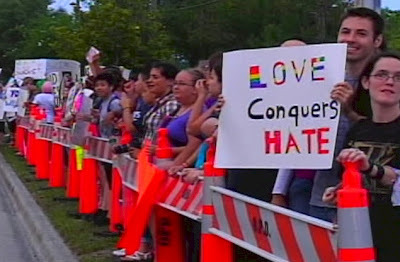 As The Midnight Review reported earlier, the extreme Christian organization, the Westboro Baptist Church, protested local Orlando school, Dr. Phillips High School. Hundreds of counter-protesters showed up to the church's ten sign-holding members (including one ten-year-old), and later the school held a special assembly to discuss Friday's events. The church claimed the school was "infested" with homosexuals and targeted students, "brutish teachers," and "hateful parents." It is still my belief that the members of the Westboro Baptist Church violated Florida's anti-bullying laws which state. Bullying may involve teasing, social exclusion, intimidation, or public humiliation. Harassment means any threatening, insulting, or dehumanizing gesture, including written, verbal, or physical conduct directed against a student or school employee that places a student or school employee in reasonable fear of harm, as well as substantially disrupting the orderly operation of a school. Considering the church targeted students and teachers with offensive slogans and that the protest attracted hundreds of counter-protesters, causing the school to change its schedule in order deal with the extremist church, I would say the actions of those ten protesters fall under the definition of HB 669 and they should be held accountable. Contact your area's local officials to push for action against this organization that has decided to ignore Florida law in order to spread their hate.